Rochester Art Supply Inc. was started in 1959 by Robert Lesczinski, a sign painter from Rochester, New York. Robert found that he was always having trouble finding quality sign paints in Rochester. He was often forced to order his paints through the mail to restock his supplies. This become quite a chore, so he decided to start his own art supply business. With the help of his brother, Ed and sister, Mary, Rochester Art Supply was born. Originally downtown on West Main St. The store specialized in sign paints, screen printing supplies, artist brushes, and basic art supplies. Wanting it to be a family run business, Ed frequently hired his nephews, John and Mike, to work at the store during their school summer vacations. In 1977, after Robert and Mary had left the business to pursue other endeavors, John and Mike were summoned to help out when Ed become ill and needed assistance in managing the business. They put their careers on hold to help out, and never looked back; they purchased Rochester Art Supply from their uncle. Since they practically grew up in the store, they knew just what was needed to improve the business. They moved the small shop across West St. to a larger building and made other changes that put the company on the map for fine artist supplies. Mike Lesczinski made it his main goal to bring quality supplies to their store’s shelves and expanded the inventory to include products for all different mediums. Mike wanted artists to be able to go to just one place and find everything they needed for their pieces and studios. He wanted customers to be able to select their supplies from the best products on the market and over the years, he successfully introduced many new materials and specialty lines. Rochester Art Supply was one of the first importers of the popular Escoda brushes from Spain and the first store to have encaustic wax paints. Even better, the store was the first in the United States to offer the renowned Henri Roche’ Pastel line. Roche’ pastels are one of the hardest lines for artists to get their hands on since they are manufactured by a small company located in Paris, France. 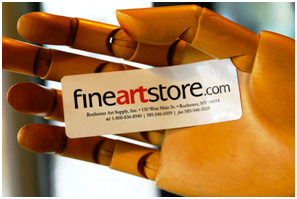 Rochester Art Supply may have originally started as a source for sign painting supplies but with the help of John and Mike it now serves as an international marketplace for quality, brand name art supplies for the professional fine artist. The store still carries the sign painting supplies that gave it a starting point, but now it proudly carries top of the line pastels, oils, watercolors, acrylics, charcoal, brushes, Plein Air ( painting on location) supplies, encaustics, papermaking materials, canvas, drawing supplies, decorative papers, calligraphy sets, airbrush equipment, linen, artist easels, and abundantly more. Shortly after that visit, he was hired by the company. “I was born and raised in Rochester, and although I am not a member of the Lesczinski family, I often feel as though I have been adopted by them! “, he jokes. 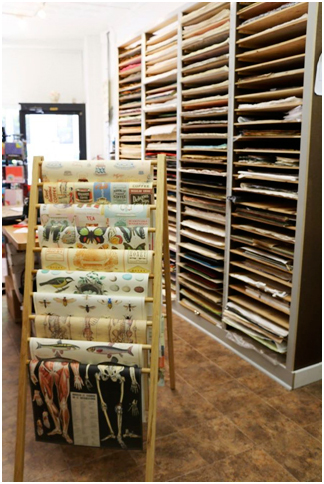 Check out their new paper room…filled with papers from all over the world! David is of course, nearby, ready to assist with his creative eye. Their online store is as massive as any art e-store we have ever seen. 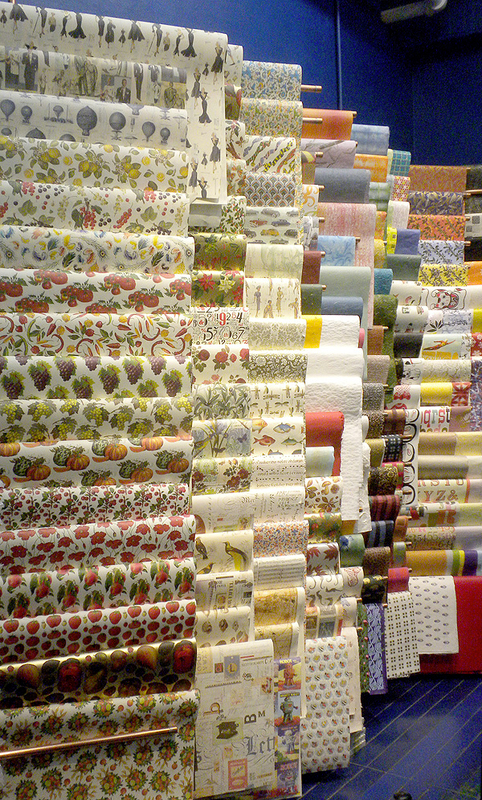 You will find a full page devoted to Rossi decorative papers alone. FineArtStore.com has a blog that features new products, different art techniques, such as how to make any surface ready for drawing or how to make custom chalk lettering signs. On the website there is an amazing library of art training videos one can access on line for free. There are also YouTube videos (youtube.com/fineartstore) to help educate, and the store holds art classes in their Cascade Art Center. These marketing geniuses have a fabulous colorful Facebook page (https:/www.facebook.com/FineArtStore) highlighting in store promotions, trivia contests and featured artists. Find them on Twitter and LinkedIn as well. They are also partnered with Amazon. One Google reviewer says of the website, “There is an amazing selection of everything!” We say, that pretty much sums it up. For more information go to: www.fineartstore.com or Rochester Art Supply, 150 West Main St., Rochester, N.Y.